The town will be resurfacing Austin Avenue beginning the week of Monday, April 22, 2019. 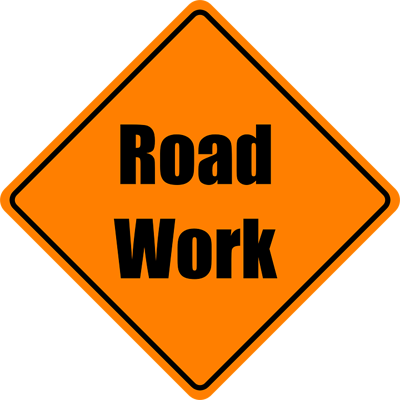 Preliminary work has begun during the week of April 15th, with repairs to storm and sanitary sewer structures. It is anticipated that this work may create minor delays and some local detours. If you have any questions, please contact the Department of Public Works office at 401-233-1034. The actual start date for this work is subject to weather conditions and will be rescheduled accordingly. Kenneth Gloss, proprietor of the internationally known Brattle Book Shop in Boston’s Downtown Crossing section, will give a free and open talk, Tuesday, April 30, 6:30 p.m. Ken will discuss the value of old and rare books. 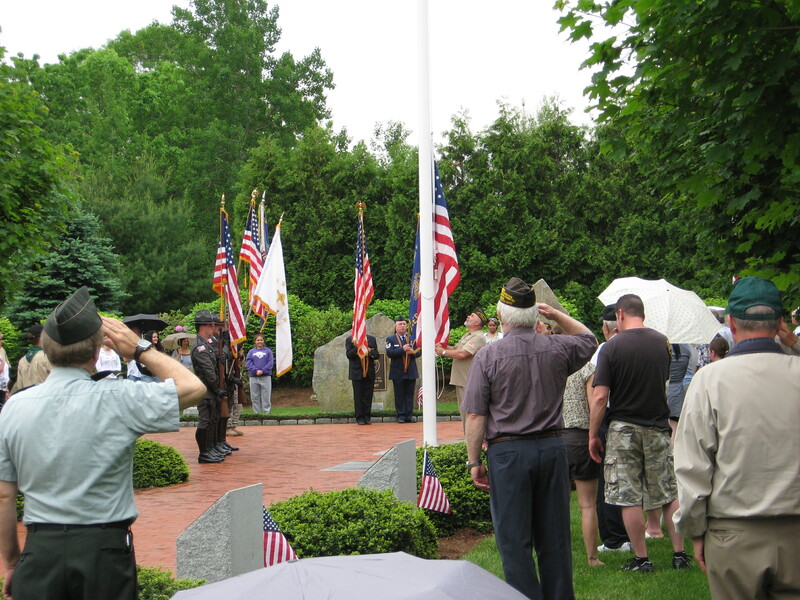 American Legion Balfour-Cole Post 64, Smithfield Memorial Veterans of Foreign Wars Post 2929 and its Auxiliary will hold a joint memorial service at the Veterans’ Memorial, Deerfield Park, Smithfield, on Monday, May 27th. The ceremony will begin at 10:30 AM with a parade of colors featuring the honor guards from the Smithfield Police Department and the Smithfield Fire Department. The public is welcome and encouraged to observe and pay their respects to those who died in service to our country. The town’s veterans respectfully request that the youth of Smithfield please join us to observe this ceremony in order that they will always remember the sacrifices our men and women in uniform endured for their freedoms. In conjunction with the Smithfield Senior Center, in support of Operation Stand Down Rhode Island, there will be a collection of clothing. Donations of new socks and underwear are requested and will be distributed to homeless veterans around the state. 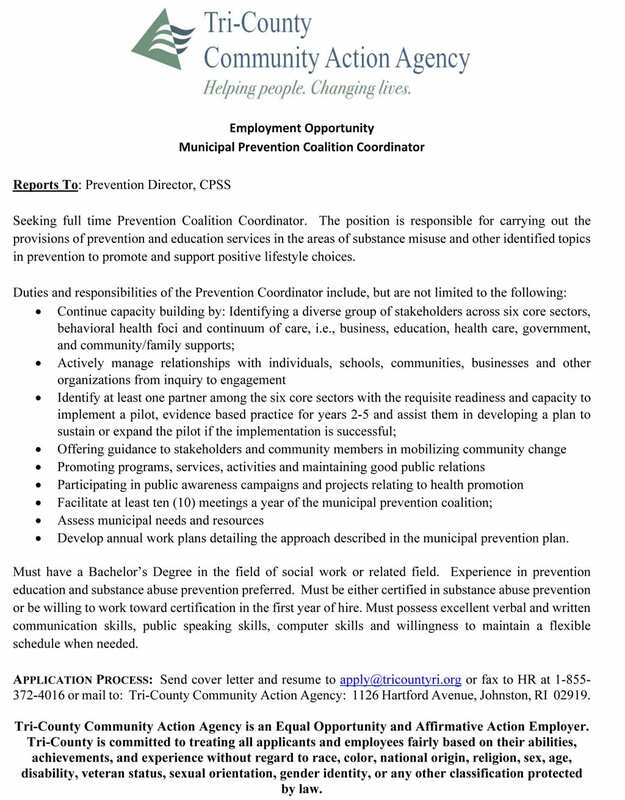 The Tri-County Community Action Agency is seeking a full time Prevention Coalition Coordinator. The position is responsible for carrying out the provisions of prevention and education services in the areas of substance misuse and other identified topics in prevention to promote and support positive lifestyle choices. The Town of Smithfield has transitioned to the Code Red Resident Emergency Notification System. Code Red replaces the Nixle emergency notification system and will allow the town to be compatible with state emergency agencies and more communities in Rhode Island. In the event of a town-wide emergency or a localized geographical emergency, the town’s police department, fire department, emergency management agency or designated local official will be able to call, email, and text thousands of residents at once, notifying them of the emergency and also give instructions if needed. Using mapping databases Code Red can target a notification to a few residents on one street, or expand to any designated area within the town. Messages regarding the safety, property or welfare of our residents will be disseminated using the Code Red system. These may include local AMBER alerts, locations of shelters for weather events, emergency instructions due to a large fire or chemical incident, boil water advisories, evacuation notices, etc. Technology plays a vital role in everyone’s day-to-day life. We know that not everyone uses a house phone today. In Rhode Island, most 9-1-1 calls are made from a cell phone. The 9-1-1 call-out database is compiled of home phone numbers, there is no 9-1-1 database for cell phones. 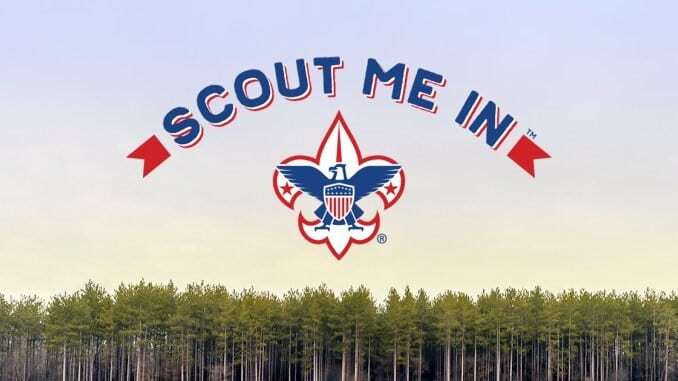 More people use email and texting to communicate and the town wants to ensure that we can use those avenues to communicate with our residents for official information. We encourage everyone to register with Code Red. To do so click on the Code Red logo above to go to the registration site. Users can register for emergency notifications only and can also register for general notifications as well. Residents should know that the information they provide on the link is safe. Information is not, and will not be, shared with anyone. No one has access to the account but local and state emergency officials authorized to activate warnings and alerts to the public. 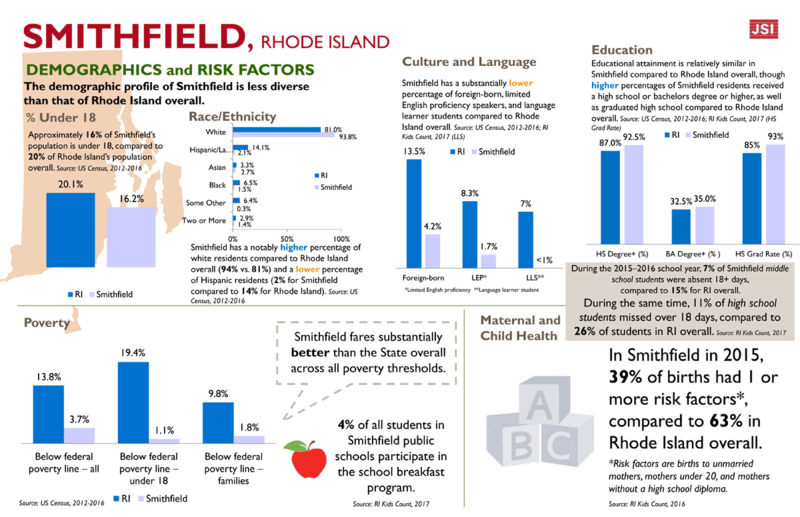 This Data Placemat from Smithfield Prevention Coalition (now part of the Southern Providence County Regional Coalition) reflects some of the data that has been collected through focus groups as well as key informant interviews that were conducted with the input from parents, community members and students from our town. 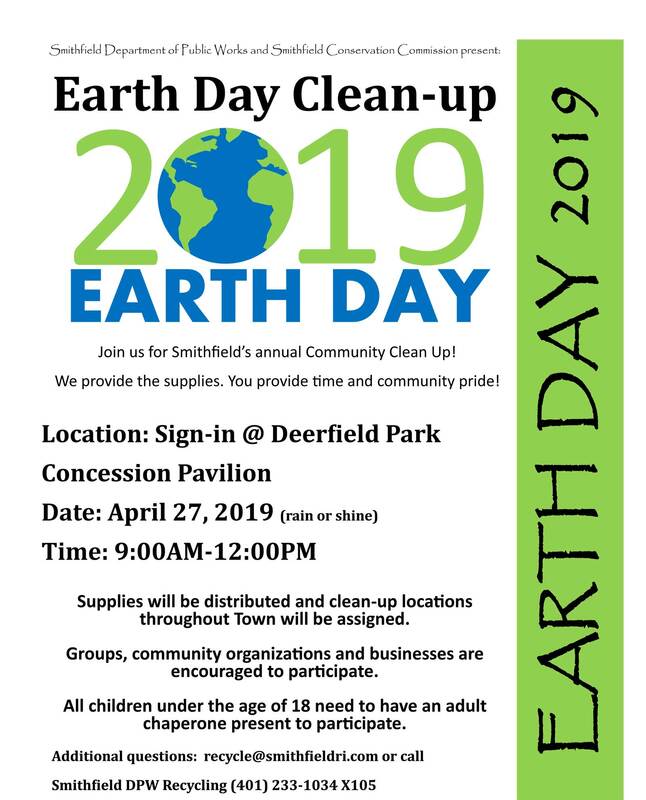 This is the place to post your Smithfield events and notices including sports registrations, class reunions, fund raisers, school events, etc. If it’s Smithfield-related, we want to post it. (Not-for-profit organizations only please.) In most cases your info will be posted within one business day of receiving it. If reporting for an organization, include your name and position within the organization. Please e-mail your info to Bill Pilkington. Posts are listed in the order received. Events will be removed after completion. General notices need to be renewed every 90 days. 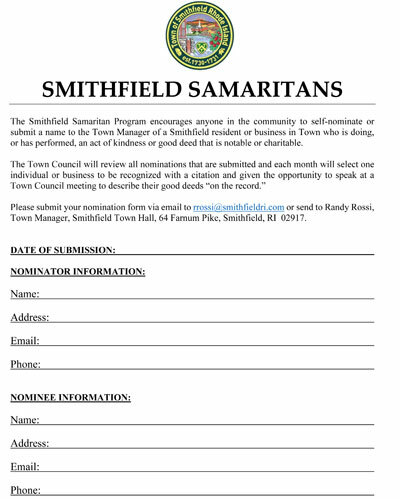 The Town of Smithfield reserves the right to screen all submissions and determine if they are appropriate for this website.